Made in the USA, this robust multi-tool ring integrates 11 different built-in uses and fits in the palm of your hand. It comes with a variety of hex heads, a spoke wrench, plus a Flathead, Philips, and Torx Head driver. It can be used as a drill bit. It opens bottles. It’s TSA-approved for travel. And it all fits in your pocket. 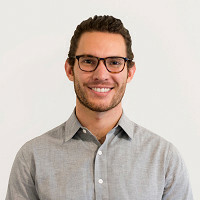 Maker Jonathan Sabutis is committed to doing more with less. Reductivist eschews “fashion,” “style,” and “luxury” to make timeless, durable products. The Ringtool itself is made of stainless steel (Reductivist's pledge of "no plastic") and it’s made in New York (“no off-shoring”). They even back the Ringtool with a lifetime warranty. The Ringtool was born as a bike accessory, but Jonathan soon realized that its size, versatility, and lightweight design made its appeal a lot more universal. Hello everyone! I'm proud to introduce the Ringtool to The Grommet. I'd be happy to answer any questions you have! You manufactured Ringtool the US, offer a lifetime warranty, and made it TSA approved. Did you see those elements as essential in developing this? @Mike Yes, the idea was EVERY day carry. This tool is built to outlast you. Why is this something people should have with them at all times? @Mike Because you should be prepared for anything! Like a boyscout;) But seriously, it's nice to not have to remember to throw a tool in your bag everyday. You never know when you'll need one! This is such a useful tool for on the go, how did you get the idea? @Mike I wanted maximum functionality on my keychain. It didn't exist so I started prototyping ideas. Too expensive, I'm sure it's quality but to pricey. Hi Bob, it is quality! High-grade stainless steel with a lifetime warranty made in the USA and TSA approved. I'm not sure it could get better! @Bob They could have had it made in China so it would cost less, but this company chose to make their product in the USA. If we want vendors to keep doing this, we consumers need to step up and pay the price, in my opinion. Beth, I couldn't have said it any better. That was beautiful. I definitely prefer to buy USA-made things. This looks like a great gift. Have you thought of offering a quantity discount? Something like 4 for $100 or 6 for $150? Hi Diana, that could be a possibility for our Wholesale team especially. We'll see if we can make it happen on here, too. Stay tuned! I like this idea. I just posted what a great gift idea it was and as I am looking through people,I can come up with 4 easily. A discount would be AWESOME!!!!! @Mike I too would like to give this product my 'vote-of-confidence' while at the same time saying that I, and I'm sure others like me who have mentioned that the price of a particular item is beyond what we can afford to spend for something that isn't a 'necessary item', my circumstances (retired, living on a pension and social security) make me have to choose very carefully what I spend my money on. This should not be construed as a criticism of your product, or of your marketing strategy; it's simply a given for a lot of us out here who otherwise want to congratulate you on your initiative and your industry. @Mike this is not too expensive for me and I like the idea of US-made quality, but I'm based in the UK. I wish more Grommet products were available to me (with a fair and reasonable shipping charge). This product looks awesome, by the way! Hi Mike, I'm glad to hear it. We, too, are hoping to get more products to you guys across the pond! Doug, thanks very much for your comment. We understand it will be out of the budget for some, but we thank you for taking the time to show your support of a truly innovative product! Regarding price... I've purchased tools including hammers,rakes, screwdrivers, shovels, pliers and paintbrushes... I've always been able to find cheap and flimsy... but I can also find quality at a higher price. I'm never shocked because I realize that quality doesn't come cheap. You get what you pay for... and I want my products made from quality materials by Americans who are able to live a quality of life that we expect in America. If I truly can't afford it, then I will make do with a cheaper product... but I sure wouldn't complain about the higher price for a higher quality product. How much does it weigh? I'm concerned about the weight. @Michele Good question: around one ounce. Great Idea-and love the innovation. And I understand the "step up and pay the price for USA stuff"--but the price does seem too high. If I were to buy 4 of them for friends for Christmas...yikes. The Price vs. Value seems high-even knowing its a USA product. Sorry. Then what's your point in debating the listed price of an item? This is not the 1980's USSR, where it's the only product on the shelf and the price is artificially determined. Unless you were hoping to publicly haggle a lower price, your comments seem very Troll-ish and petty. What a great gift idea - not just for a man ... As a woman I would love to have one of these also. I see this coming in handing in a variety of ways. Congratulations on a fabulous idea. Thanks so much, Pat! This is a product anyone can find useful! Where I threw my 2 cents in on the fact that I would love 2 see a discount on multi (3 or more) purchases ... I in NO WAY think that this is over priced. I will be ordering one (if they are still around after payday) and I thanks for what looks to be a great product. I know my husband will love it! Thanks, Pat! We are glad to hear it. With how well these are doing, they will be around for a looong time. No need to worry about that! Is this machined or cast? @Jeffrey precision investment cast then tempered and hardened. We've not had anyone break one yet, if you are concerned. They are designed to last. Seems likely to scratch and / or damage a vehicle. If on a key ring that goes into a vehicle ignition, it will swing with vehicle movements and scratch your vehicle. Does it come with any type of casing to prevent this? @Tonya Hi Tonya, I've found that it's no more likely to scratch things than the keys that are already on your keyring. Good to know there is a market for it, Joseph! We'll be sure to take it into consideration. Stay tuned! Charles, this product is so useful it may be able to break Murphy's Law! I have to agree with the comments below on price. I love this idea and the product...and the idea that manufacturing is done in the US just brings it all home. I could easily see this being a great gift, but the price is a but of a sticking point for the product. Is it possible to look into the manufacturing cost? Not meaning to be negative here, only a helpful criticism. if this were a $15 to $18 product it would fly off the shelf. Hi Laura, thanks for the comment. It already is flying off our shelf! Unfortunately, a high-quality, TSA-approved, made in the USA product with a lifetime warranty has its price. I'm sure Jon has looked into the most affordable manufacturing cost, but I'll let him dig into that if he'd like. To get it to the price point you described, Jon would likely have to scrap the Made in the USA element. looks like a great little tool especially for bike owners, however: seems a little pricey ! A high-quality, TSA-approved, everyday tool that is made in the USA with a lifetime warranty is going to have its price, Skip. For something cheaper, you are likely not going to see that Made in the USA stamp. I see others saying we should be willing to pay more for made in USA products. Thats all well and good, except, i do not want to over pay for USA products any more than i would for a out of country product. I am very willing to pay a bit more but not willing to over pay. Thanks for the chatter, thats how things get resolved. Thanks, Skip! It all comes down to the individual. But just know the price also reflects the durability and high-quality nature of the product. You will be getting your money's worth! I represent products made in the USA. It's great that you don't do what people like BOB think...make it off shore as it's less expensive. Made in the USA is becoming more meaningful everyday to the consumer. Keep making your products here! Thanks so much for the kind words of support, David! Looks like an innovative product. I carry a small Swiss Army multi-tool with me all the time so I like to be prepared, but I don't have a bike and would like to know some other uses for this tool. I can see using the Phillips screwdriver and the bottle opener function but where else would I find it useful? It sure is, Karen! It's for anything you might use a screwdriver for. Opening a paint can or a box, taking off an outlet cover. I know I could've used this when taking apart my couch which had hexagon screws. The uses will likely be endless! Why not make the center a 3/8, 7/16, 1/2, 5/8" nut wrench? a bottle opener, come on. All of them, Fred? I don't know if those will fit. Also, after fixing a bike, I think I'd rather have a beer. @FRED, We did prototype this but it was tremendously difficult to use. I love it! I love tools and this would be perfect for me. And for Christmas presents for my 5 sons and husband. Unfortunately I live on a small disability and this would be a luxury instead of a necessity. Awesome invention though!! Thanks so much for the kind words, Margie! Talking about TSA approved. Seems each airport I go to has a different way of dealing with the items you carry. How would I know that all ISA agents know it is approved and not take it away? Is it listed for them somewhere so that I could tell them to go look up the approval. They seem to have their own set of ideas at times. @Bob All I can tell you is that I fly frequently both domestically and internationally with the tool in my carry bag and never had a problem. Jonathan, This is a great piece of engineering. IF I may make a recommendation for future thought. 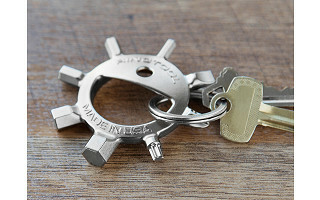 I used to have a key chain which had similar shape (Without all the tools), it had a pry off, a slot cut out of the edge on the bottom for can tabs, and then it had the shape on the inside of the ring for bottle tops. I love this product and will probably buy one but it would be awesome if you added the points of a bottle top on the inside of the ring (Which is an unused area at this point) which makes a great grip to twist off bottle tops. Thanks for the suggestions, Daniel! And I hope you enjoy Ringtool! This looks like a great gift.I would like to buy several .Do you have a discount code i could use? Not at the moment, but referring a friend can help you save. And if you buy more than two, you get free shipping! I like the product, but the video sounds like you recorded it in your shower. Hi Frank, as part of our video creation process, we like to get a word from our Makers. Many, if not all, do not have access to professional equipment. We feel the content of the Maker's footage far outweighs the sound quality. If that is Jon's shower, my goodness, it is spotless and spacious! Though that wouldn't be a surprise with how many of these Ringtools being sold. Do you know if these are small enough to work on standard surfboard fins? Hi Robert, could you be a bit more specific? Work on how? Thanks for the suggestions, Chad! I have no doubt, Jonathan, would agree your second to last sentence is the end goal. With enough support on here, he can get there! Hi Jonathan!!! Thank you for helping me make Christmas shopping so easy this year! I purchased a few to hand out to the men who "have everything" and is difficult to shop for. I appreciate your consideration in having this tool manufactured in the USA and having a lifetime warranty. Thank you, Thank you, THANK YOU!!!! Thank YOU, Rebecca, for your kind words! Tell your friends! Jon and the rest of the Makers here on site can make everyone's holiday shopping a breeze! Please knock it off with the GIFs for replies. They are annoying and tiring on the eyes when trying to read other things on the page, because they never stop moving. You're not trying to be Buzzfeed, are you? Is there something on this that proves it's TSA Approved or is there a way to prove to TSA that it is approved? I've had such varying experiences with TSA that I'm afraid it'll eventually be confiscated. @Matt, check out the TSA site and on the upper right hand corner of the page is a search bar named "What can I bring?".... this key-ring will NOT be confiscated due to the fact that it s just that....a key-ring....that has tools....BUT more importantly, no knife. Hope this helps. Hi Matt, as Jon says above, he has never had any trouble on a number of flights. Additionally, according to the TSA website, any screwdriver under 7" end to end is permitted on a checked or carry on bag. Beat me by a nose, Rebecca! Thanks for passing that along! @Mike @Rebecca Thanks for the replies. I'm placing my order now. Price is reasonable, it's durable, made in the USA and opens beers. What else could you ask for? That's what I'm saying, Matt! Happy to help, enjoy! Can you tell us what sizes are available for the hex keys and torx? Metric or SAE versions available? Hi Neil, below is a complete list of the sizes of tools on Ringtool. This is currently the only version. I absolutely love your product!!!!! It will be absolutely perfect for my job too!!!! I will put this on my key ring for work and no more having to make sure I need all my separate tools for my job!!! I love that it is made in America!! I personally don't mind the price since this American made product is all I will be carrying around instead of 8 separate tools!!!! Thank you for your excellent idea!!!!!! @DENISE A On behalf of Reductivist and the 50+ people at Grommet, you are welcome!!!!!!!!! 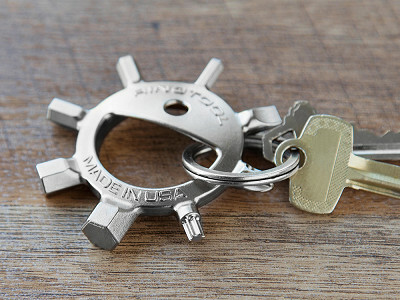 Made in the USA, this robust multi-tool ring integrates 11 different built-in uses and fits in the palm of your hand. It comes with a variety of hex heads, a spoke wrench, plus a Flathead, Philips, and Torx Head driver. It can be used as a drill bit. It opens bottles. It’s TSA-approved for travel. And it all fits in your pocket. Maker Jonathan Sabutis is committed to doing more with less. Reductivist eschews “fashion,” “style,” and “luxury” to make timeless, durable products. The Ringtool itself is made of stainless steel (Reductivist's pledge of "no plastic") and it’s made in New York (“no off-shoring”). They even back the Ringtool with a lifetime warranty.